Resistive Touch IC - ET&T Technology Co., Ltd. Fully integrated processor in one single chip brings cost and space effective, and with features a wide voltage operating range from 3.3 to 5.5V, low power consumption and watchdog timer. A sample circuit diagram will be provided to help users to utilize these chips on their own devices. 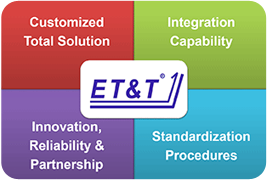 For control Chip application, ET&T provides ODM / design services featuring customizations from PCB layout design, integration with other devices, to finished products. Combination of design and practical integration over 10 years has lead to the development of unique solutions for customers.